Lovers, in the left corner you will spot Stuart Weitzman’s playful Pipeswoon Platform Pump; to the right prepare to marvel over the coquettish aesthetic of Mossimo Black’s Versie Pumps in Leopard via Target. Though the heel of the majestic Mossimo’s is slightly lower (3.75 inches) than that of the wondrous Weitzman’s, and is constructed of textile materials as opposed to the haircalf upper of the originals; for a mere $29.99, in comparison to the $158.00 asking price of their haute couture counterparts, they are every bit as capable of adding a touch of high fashion ferocity to the fashionista’s shoe collection – on a frugalista budget! 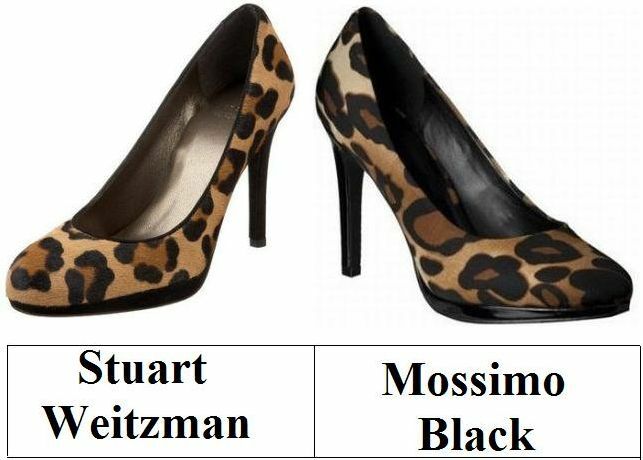 Will Stuart Weitzman tempt you into being a big spender, or will Mossimo Black inspire you to save? Thanks to Endless and Target for the pictures. Don't forget to enter the Make A Wish Giveaway for your chance to win a Black Enamel Four Leaf Clover Necklace from Regina Pierallini Jewelry Design. I'm not a big fan of leopard print items, but I would definitely get the Mossimos for my sister. Have a happy Thursday, E.
Definitely lower heel, and lower price. I like to use just a hint of trendy patterns, like in a shoe, or scarf, so these are nice. Oh man! I'm completely obsessed with heels, especially ones with cool patterns! I love the Stuart Weitzman's much better! But my budget likes the Mossimo Black's much better! I neeed a leopard pair of pumps! Sigh! Hmmmm... Am going to have to be a big spender today ~ those Stuart Weitzmans are too gorgeous! I must get to target. Although, I'd probably just wear the flats, though. I love this pattern. Yeah! for Target! Target has it all! i have to say i like the Stuarts better though. I can't put my finger on why exactly...they almost look "lighter" to me. Great look for less! I think I like the lighter look of the more expensive ones. i love leopard pieces ! I will be a big spender today...! I love how you find a high price item you like and then find a more affordable option. It helps me know where I need to look for my clients. Wow those are so similar! I love leopard print, but I always fear a cheap looking print. I think for that reason I couldn't bare to get the Mossimo pair. Seeing them together, I wouldn't be able to get the SW either. The Mossimo pair does look better than a $30 shoe..... I would have to sit this one out though! I've been dyinggggggg for a pair of leopard heels, these are super cute! good find erika! Oh My Goodness! Are you kidding me? Yesterday while in SF I was telling Brandi how I have been looking for leopard print heels all over. You found them for me! Going to Target today! i'd definitely go for the mossimo black pair! I actually like the Mossimo's better and think the fabric is more expensive looking than the dyed pony hair. Yay, you did it again Erika--always an amazing find! Because of you I bought my first animal print bag EVER! Definitely the Target ones... They're too trendy for me to spend that much! Both pairs of pumps are gorgeous! I love leopard print. I think I'm going to be a big spender and go with the SW! I never did find a leopard print dress for fall. I'm so thankful for TARGET! I so love this deal. Great find. this is a really good deal... what did we do before target existed? Such a great look from Target. I would definitely go for the lower heel as they would get much more wear and at that price would be so much better value. I don't think I've ever seen such perfect shoes!!! The Stuart Weitzman ones are incredible. Mossimo's for me--I need that lower heel! These would be so cute with a little black dress. Oooh!! Love Mossimo!! I'm always so inspired to save, and can't beat $29.99. I'm a target girl, so i would grab the mossimos! Go Target! I can't wait to visit when I'm back in the US! I am totally heading to Target tomorrow! I love Target so much. Those shoes are so hot. Looks like I need to make a trip to Target ASAP! O-M-G Target?!?! I had NO idea!! You can hardly tell the difference! I would definitely go for the Mossimo pair. have to look at shape of heel to determine which i like more. WOW! practically identical! Happy Friday! I WAS going to ask if Mossimo is the Mossimo of Target but I guess they are. They (M) seem to offer good deals on clothing too. i like stuart's better so i'd go with those!